Liberty Belle exploded on the scene on the 4th of July - so lovely that her close-up photo taken the day she was born became the focal point of our farm logo! She was sired by the amazing Accoyo Express known for stamping out exceptional crias. As of 2008 Express had sired over 30 Color and Reserve Championships. 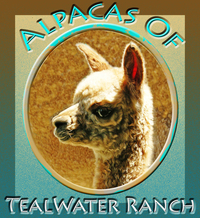 Express is the only male produced here in the U.S. by his sire Accoyo Albus before Albus was exported to England. 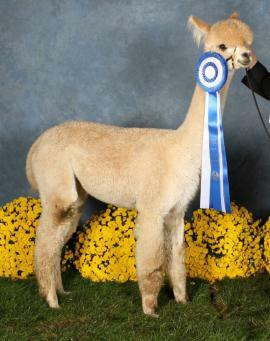 In Liberty's first showing she earned Color Champion! 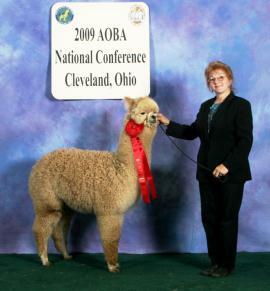 She took a Second in Full Fleece at the 2009 AOBA Nationals under judge Mike Safely from a class of 11 juveniles. 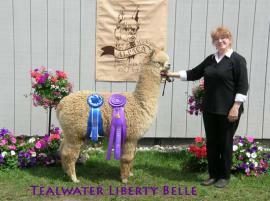 Liberty Belle won Color Champion for the second year in a row at the Michigan Breeders Show on May 2, 2010! The judge's commentary noted that Libby was the second oldest female in the Light Fawn competition, yet was holding her fineness consistently throughout the blanket earning her the Color Champion placement. Liberty's dam, Ion Rainier, was sired by Peruvian Ion, the high selling male sold for $80,000 at the America's Choice auction in 2005. 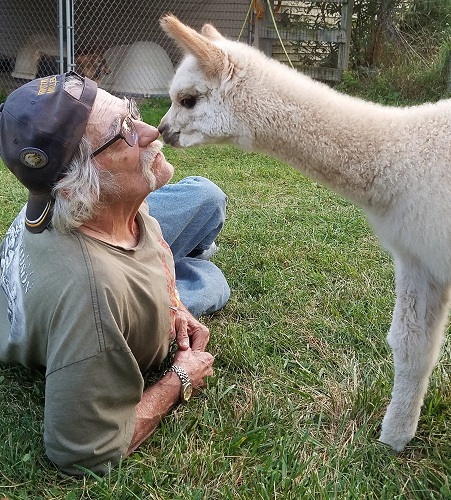 His ancestry is from the Allianza region of Peru; Ion's sire is the renowned import PPeruvian Guellermo known for producing a line of alpacas with exceptionally fine fleece that remains fine as they age. We had a gray stud in our herd with Guellermo as his grandfather - Sir Arik. This stud was still 23 micron producing gorgeous, fine soft rose gray fleece at 17 years old! 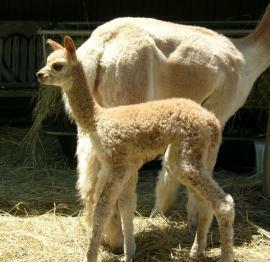 Liberty Belle has a very proud stature, correct conformation, and soft, dense and fine, crimped fleece with a glowing brightness. She has a calm, confident disposition. 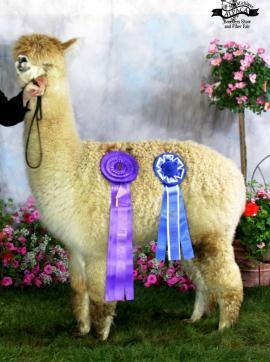 At one show the judge commented "this young girl struts in the ring like she should be champion every time!" We are not anxious to sell Liberty, but realize we can't keep all our favorites to our selves.